Imagine you were a brand new podcaster and you immediately started getting trolled on your Facebook page… and in a VERY nasty way. What would you do? 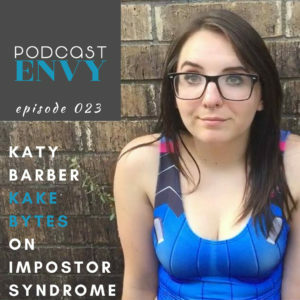 Well hopefully, you’d find a way to keep going like today’s guest, Katy Barber of KakeBytes. KakeBytes is an adventure through gaming history and Katy has a fascinating story to share with you. This episode is part of the “impostor syndrome” crossover series between my two shows, The Creative Impostor and Podcast Envy… enjoy! YOU! You can be my angel and I will be forever grateful. Please sir or ma’am, will you buy me a cup of coffee??? Donate to me just a few bucks monthly to share your appreciation and I will share more and more podcasting & creativity tips and resources. I mean, you want to make a show that matters right? You’ve got a message, a passion, a purpose. How can you make sure it’s landing? These questions from your Podcast Boss (me) will help! Oh HEY! I’m on LinkedIn now… dropping tons of pro podcasting tips, insights, and stories. Connect with me there and let me know you’re a Podcast Envy listener. Katy Barber is the producer and host of KakeBytes, a podcast adventure through history. On her show, Katy interviews people who have been working in and around the industry since its infancy and hopes that she can bring new perspectives and previously unknown stories about the video game industry. She has been involved in podcasting for four years, starting her journey on a nerdy pop culture podcast and then launching her own show in 2017. You can read more about Katy and KakeBytes at www.kakebytes.com. This entry was posted in Anxiety, Criticism, Facing Fear, Impostor Syndrome, Podcast, Podcast Envy, Podcast Envy Episodes, Social Media and tagged podcast, Podcast Envy by andrea. Bookmark the permalink.